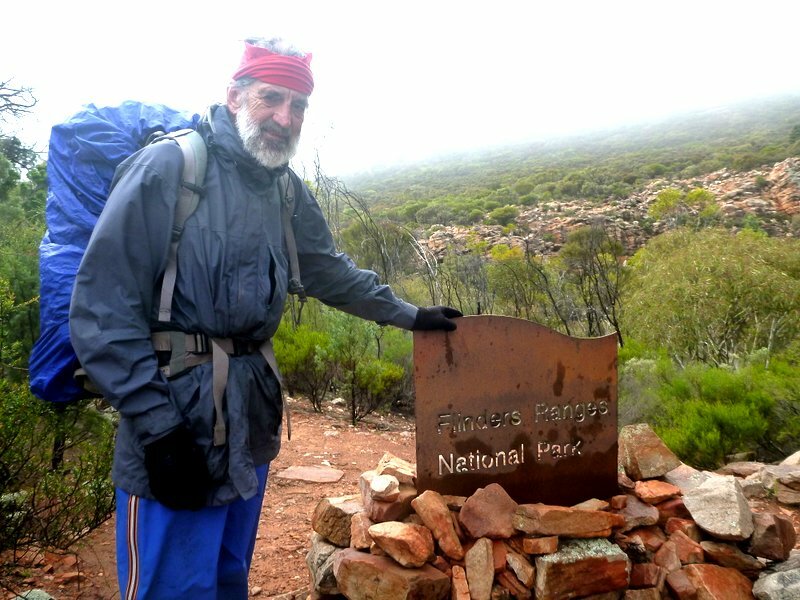 The Hans Heysen Trail is a 1200 km route from Cape Jervis in the south of South Australia to the northern end of the Flinders Ranges. Our original plan to walk the whole trail as a through hike had to be adapted once we realised the impact of winter in the south with short day length and, for us tropical beasts, extreme cold. The hike evolved into 6 sections, each 4-6 days, with stops in the towns for resupply and recreation. Local buses or taxis were used to skip sections enabling us to keep our prebooked accommodation unchanged. 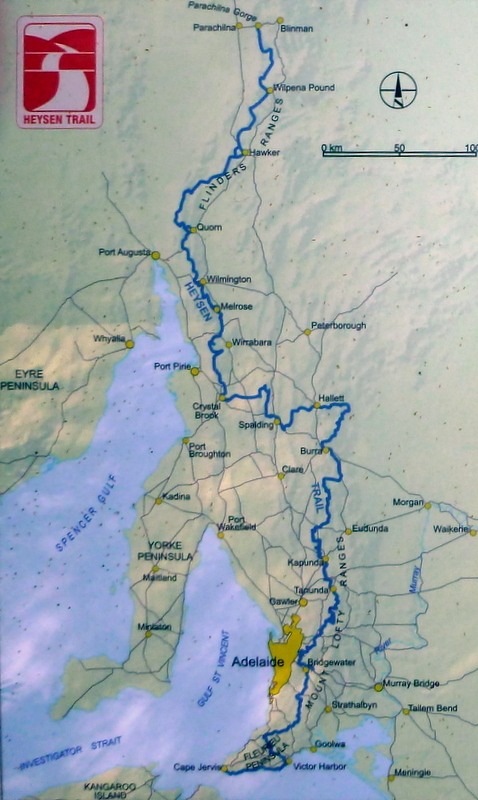 all 1200 km of the trail. Section 1. Cape Jervis to Victor Harbour. The trail follows the coastal headlands opposite Kangaroo Island, with some spectacular views. Hundreds of kangaroos along the trail, completely unafraid of hikers, especially in the first few days. Recommended for any overseas hiker who ‘wants to see a kangaroo’. Few people on the trail so it does provide a great wilderness experience. 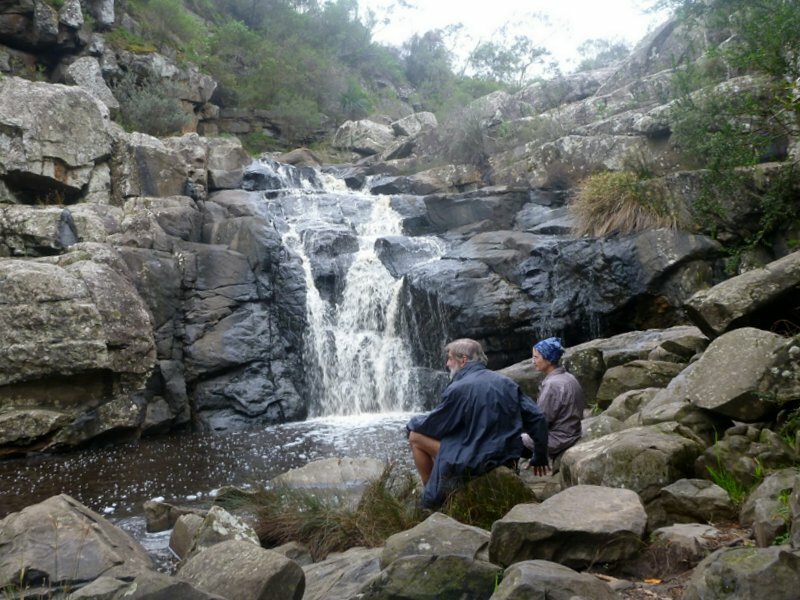 Spectacular scenery especially in the Deep Creek conservation area, especially the waterfall which stands out as a half day walk in its own right. Lots of efforts being made to revegetate with original forest with the hope of reintroducing the Glossy Cockatoo wiped out in the early 1900s by clearing its habitat. 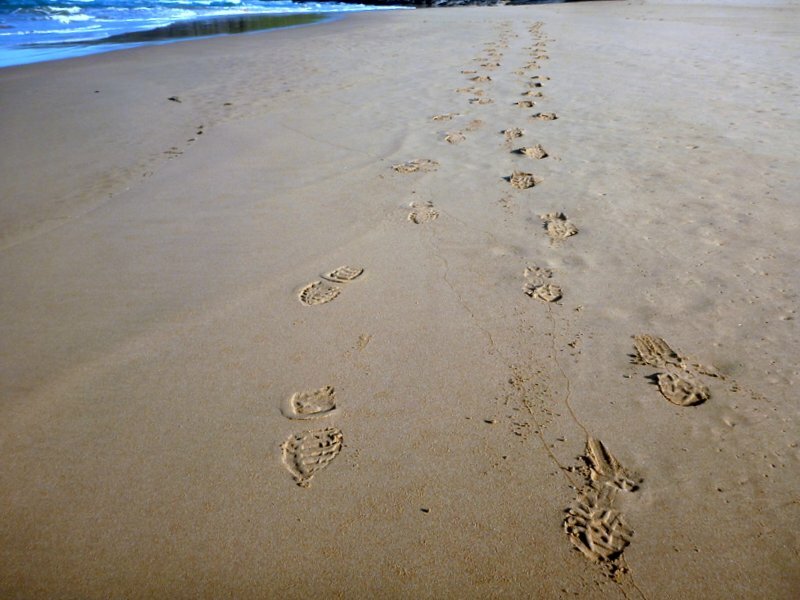 Also steps to protect the nesting sites of the Hooded Plover on the beaches and make walkers aware. We flew in to Adelaide by midday so we were able to catch the bus down to Cape Jervis that afternoon. The route around Balquidder Station following fencelines and walking in sheep and cow paddocks. (By now this should now be rerouted along the coastal cliffs). No ófficial’ camping permitted on the beaches. Official campsites are inland with car access. Freezing temperatures and high winds. As you are only allowed to start the trail after April 1, others will experience the same climate. As the days are so short over winter, it is necessary to stop walking by 4 pm so you can set up camp and cook dinner before dark at 5 pm. This means you can’t walk as far as you would normally during the day. 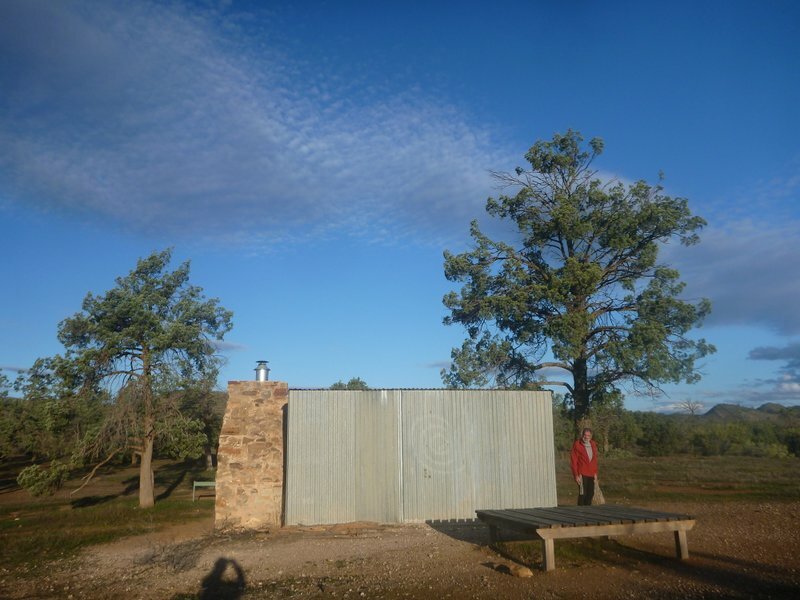 Tuesday 9th, Day 1 to Cobbler Hill Camp, 15 km. We started walking from the BB at 9 am for the 3 km into Cape Jervis and the general store where we were very pleasantly surprised to find that they stocked fuel for the MSR stove so we weren’t reliant on buying petrol. 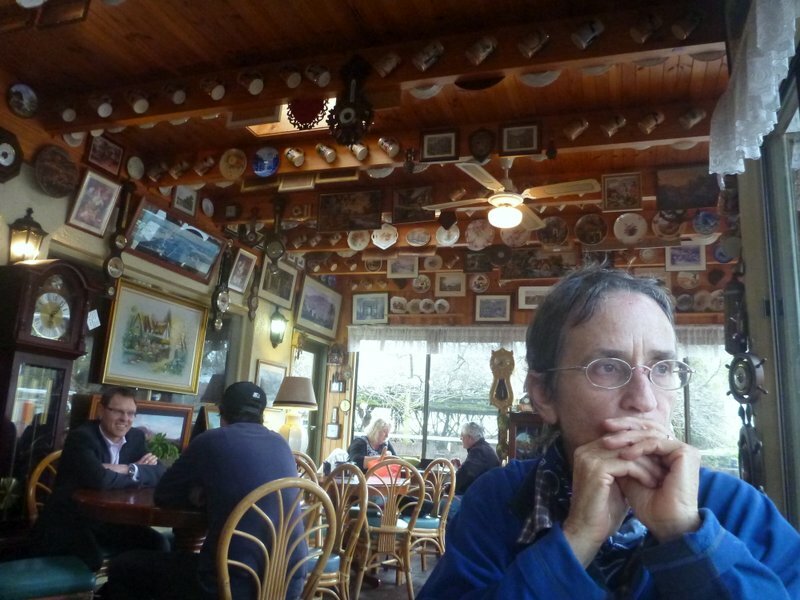 Phil Dodd at the general store is amiable and very helpful to hikers. Finally started walking the real trail at 10 am wrapped in jacket, beanie and gloves with a biting northerly wind straight off the sea and cloudy skies. Cool but not freezing or raining so good walking weather. The trail is quite rough and rocky, with many ups and downs with views across the whitecaps to Kangaroo Island. A couple of hours down the trail and Ali kicked a rock and fell with her sticks not placed to catch herself. This resulted in a cut nose from the glasses frame and a grazed forehead, but she was able to keep walking after a recovery time. We carried on down to Blowhole Beach for lunch, but then a steady and steep 300 m climb up to the ridge crest by 4 pm left us too weary to continue to Eagle Nest. Cobbler Hill camp is more set up for car campers, with several cars passing through, waking us up with their noise. One person even approached our tent to ask if we were a friend of his (we weren’t). Campsite for Day 1 at Cobbler Hill. 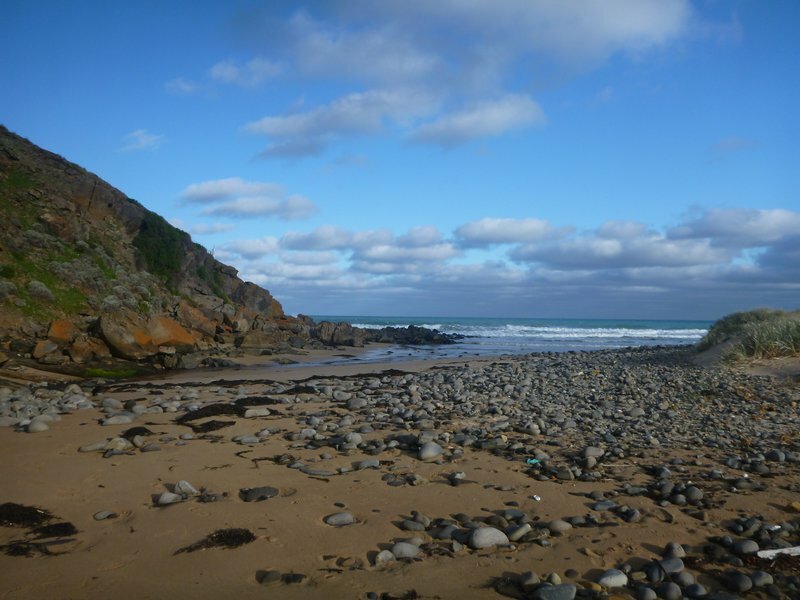 Wednesday 10th, Day 2 to Boat Harbour Beach wild camp, 13 km. 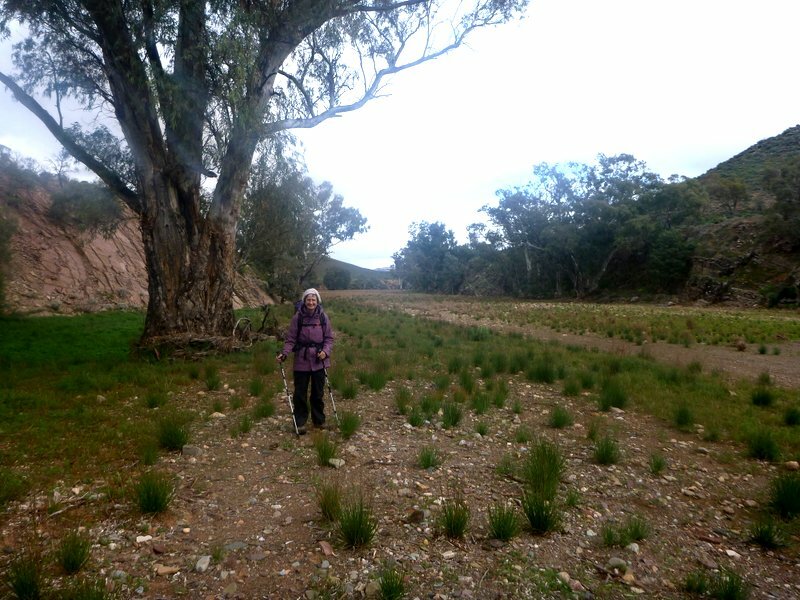 The day started with very pleasant strolling through mallee scrub to Eagle Waterhole Campsite, passing through Aaron Creek Gorge. This is a proper hikers camp with 3 sided shelter, tables, water tank and flat areas for tents. No car access is its best asset. Then we were walking through coastal heath, following firebreaks and fence lines up to Tent Rock Road, with a car park established for day hikers. Back onto a walking trail for the gently graded descent to Deep Creek Gorge with a pretty waterfall and pools as background for lunch. This is a highlight for this section of the trail so it is also popular with groups of day hikers. Back to steady climbing again and a few km of road up to the car camping at Tappanappa campground. Not wanting to have another experience like last night, we continued on down to Boat Harbour Beach and found a small nook in the scrub behind the beach and out of the wind that could fit our tent. No harbour here, with a heavy swell booming onto the boulder shore. Both of us now developing chest colds and runny noses from the constant chill. 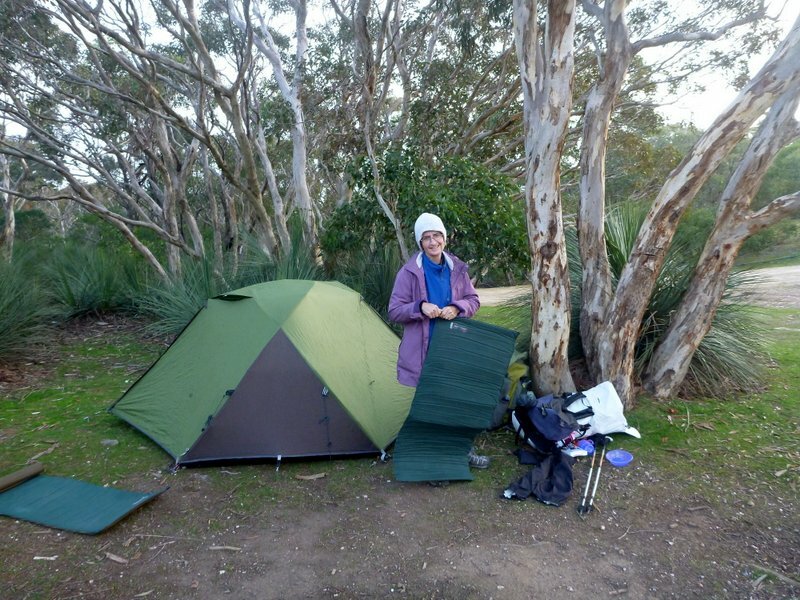 Thursday 11th, Day 3 to Coolawang Beach wild camp, 16 km. We are finding the short day length very strange, with first light around 7:30 and dark by 5:30, the loss of that couple of hours compared to summer walking, means more time in the tent and much less time for walking. 13 hours sleep last night, but breakfasted and on the trail by 8:15. Easy walking along the back of the beach, following fence lines on grassed dunes, so we don’t have to slog through sand very often. Several houses along this stretch of coast, some old, some fancy, one straight out a Jetsons cartoon, even looked like it had been helicoptered into place. At the end of Tunkalilla Beach, was the disaster of Balquidder station’s refusal to allow access. To go around the station, we are required to climb 300 m very steeply on grass straight up from the beach, finally topping out on Tunk Hill Road which we follow for 5 km past the Balquidder campsite, (a water tank in a paddock). We managed lunch in the roadside shade before starting down again on a well graded track to Coolawang Beach and a sheltered tent site near a small creek behind the beach. The water was a bit green, so we appreciate the Aquamira sterilization system. Friday 12th, Day 4 to Victor Harbour, 18 km. A clear and sunny day with a light breeze, but still very cold for us. A dozen or so fishermen were lined up along Waitpinga Beach, the walking here made difficult by the soft sand. Parsons Beach even had some surfers trying their luck. We climb up out of Waitpinga along corduroy boardwalks to the campground, again made for car campers and not attractive at all, even if it had been put in an appropriate place for walkers. Climbing again up and around Newland Head, with sadly limited views of the cliffs, as the trail is in coastal mallee most of the way to Kings road, where we leave the coast for Victor Harbour . The idea of an 8 km road bash is most unappealing, so Ali approached a young man having a smoke in the car park, who was happy to drive us into town and drop us near our motel. Fish and chips and cider for dinner. 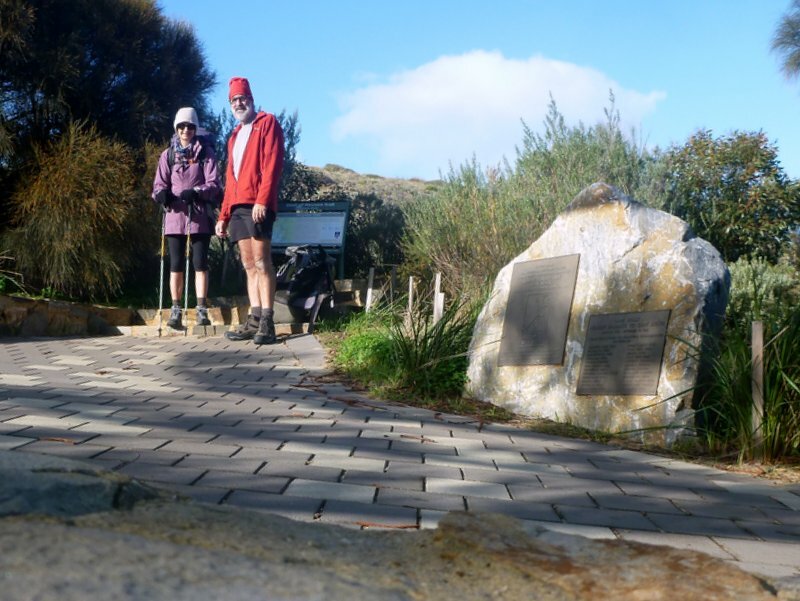 Saturday 13th, Day 5 and 6 in Victor Harbour, 0 km. We had to review our trip plan at this stage, because we just can’t make the mileage. Winter down south means shorter daylight hours and we hadn’t realised the significance of this. Our plan for 24 km a day needs 10-12 daylight hours, not the 8 we’re getting even if we cook breakfast or dinner in the dark. So we’ve booked a bus to skip the next three days of trail as well as booking an extra zero day here to get our colds under control. A double zero and a yellow blaze, so much for AT purity, who da thought. Bought Digs some tights for walking so he can be a bit warmer, and discovered that if we use a micro SD card in the camera, we can shift it into the phone to post photos easily. A sport store open on Sunday even had Keen boots, so Ali bought a slightly larger size. Our colds seem to have moved on, so we are back to walking fit again. 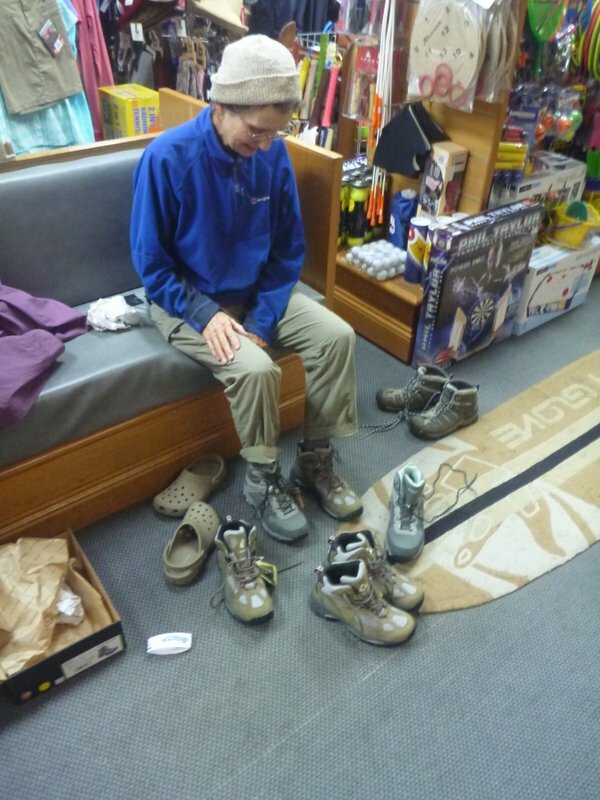 Buying new boots at Victor Harbour – which ones to choose? Section 2. 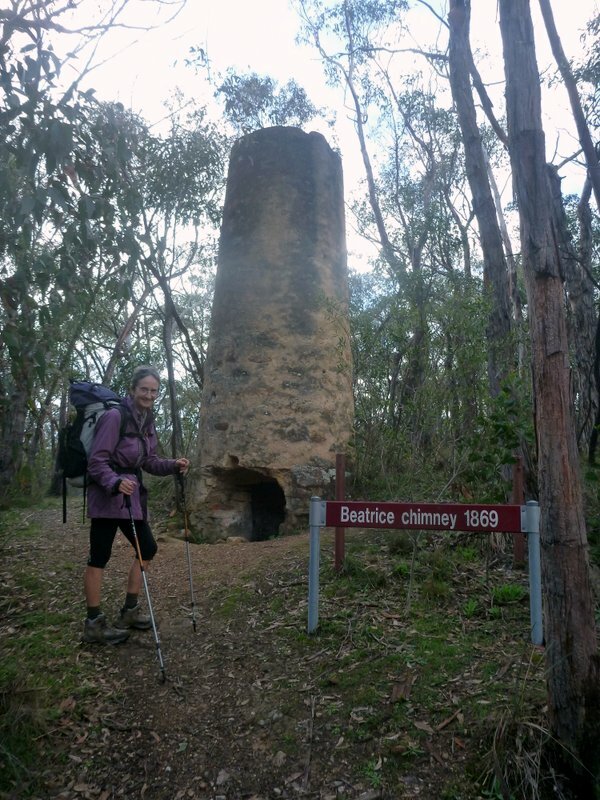 Mt Compass to Hahndorf. 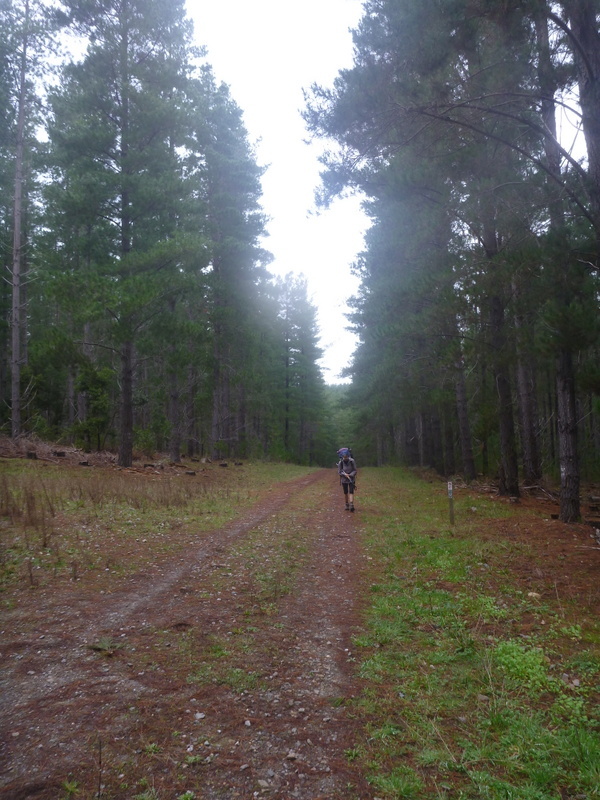 The trail leaves the coast and heads north through hilly country with some native forest but largely farmland and managed pine forests. There are few campgrounds suitable for hikers and no resupply towns along the route. Wild camps near flowing water in native woodland. Gold and Tin mining area. Trail following roads where it could be in an adjacent conservation park. Absence of hikers camping areas. Hahndorf being on an alternative route not covered by the guidebook map. The bus dropped us at the correct crossroads just before Mt Compass, so we were back on trail by 10 am. Walking fence lines and open paddocks for the first hour or so, so our feet are saturated by by the grass still wet from last night’s rain. Then a road bash for 5-6 km to Finiss River where too many fences and houses made it an unsuitable campsite. We pressed on over Mt Magnificent and found a sheltered and private spot by a creek bank a few km further on. Pleased to stop walking by 3 in the afternoon to get some down time and cook dinner in daylight. A good night’s sleep. 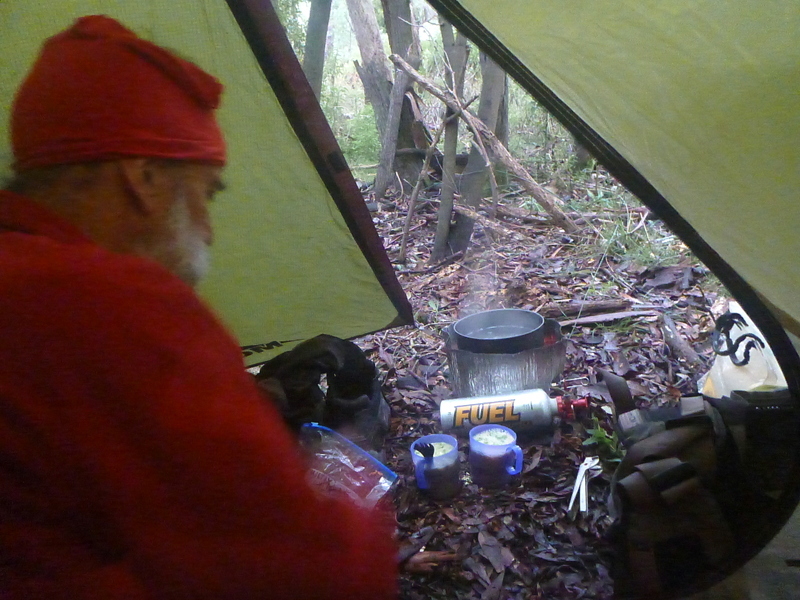 Tuesday 16th, Day 8 to Kuitpo Forest wild camp. 14 km. The pleasant creek side path gave way eventually to road bashing until a conservation park came up on our right, but the trail continued along the road for another km ignoring the parkland. The trail finally turned into the park area to give us a couple of km of regenerating eucalypt forest planted in 1983, before we were back into pine forest for the rest of the morning and lunch on a picnic table at the Kuitpo forest HQ. Chookaloo, our target campsite for the night, proved to be another car campsite with many people around walking dogs, riding bikes and horses so we carried on to setup another wild camp by 3pm in eucalypt forest above an area of young pines. 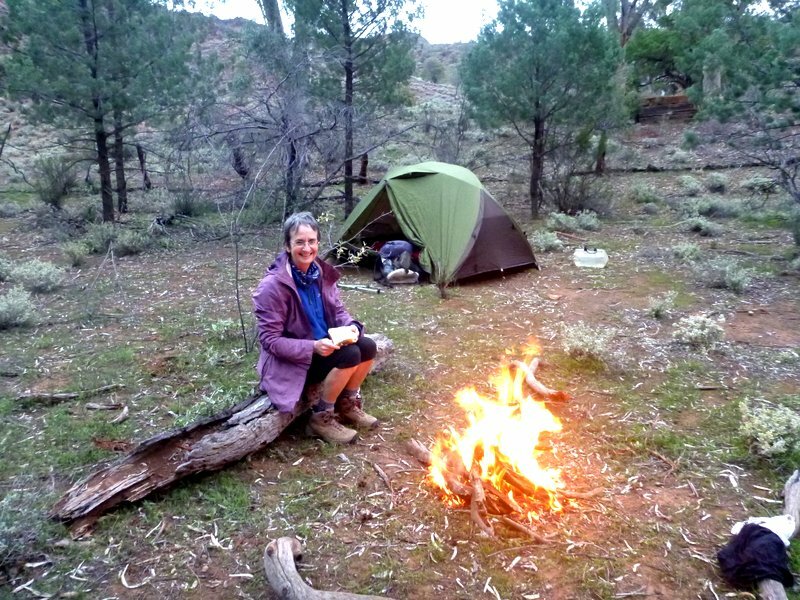 Wednesday 17th, Day 9 to Goyder Reserve, 26 km. Easy rambling most of the day today along pine forest management roads and then horse trails through an old gold mining area. Diggings and tailings piles everywhere with several 5 m deep shafts fenced off. An adit opened in 1920 is still open for visitors with signs suggesting taking a helmet and torch. Two men with detectors, so there must still be some bits around. Several hundred meters of boardwalk through a swampy section showed that at least some money is being spent for walkers. Climbing through farmland to a ridge line road, then another 6 km road bash to the Goyder Reserve by the Onkaparinga river a couple of km short of Mylor, but right on the turnoff for Hahndorf where we are booked for tomorrow. The reserve is barren and exposed to view from the road, so finding a stealthy site was a bit tricky. A noisy and wet night, with traffic humming on the bridge. 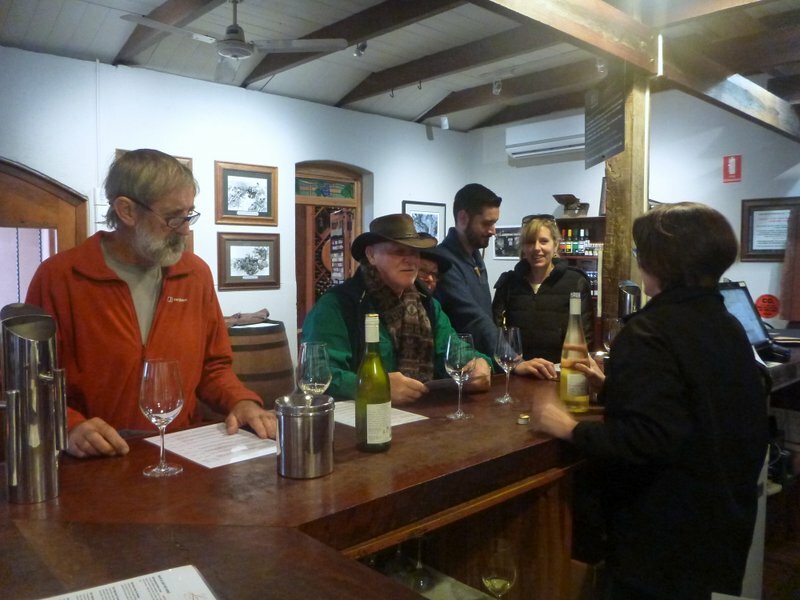 Thursday 18th and Fri 19th, Day 10 to Hahndorf, 0 km. We were able to take down the tent and pack up during a break in the showers. Not looking forward to the 8 km up a narrow, winding and busy road to Handorf, but the option is there to stick out a thumb even though it’s raining. So we do and the first car stops for us! This bit of trail magic left us in Hahndorf too early to move into our rooms, but we were able to drop packs at the visitor centre and go off for breakfast and a wander through town. Hahndorf is very much a tourist town pushing its German heritage and altruistic start, so lunch is with cuckoo clocks and a stein collection while dinner in the German Arms is accompanied by oompah music. 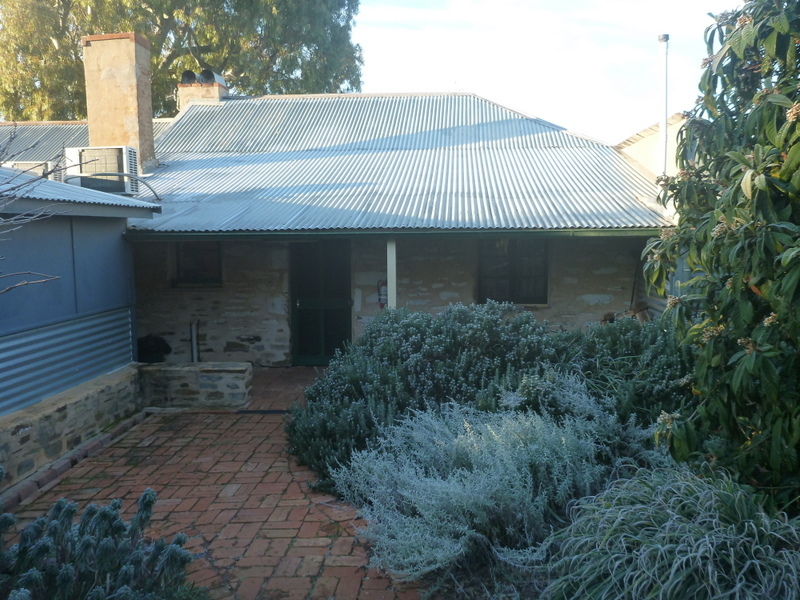 We spent Friday morning with a visit to Hans Heysen’s home “The Cedars”, about 2 km from town. 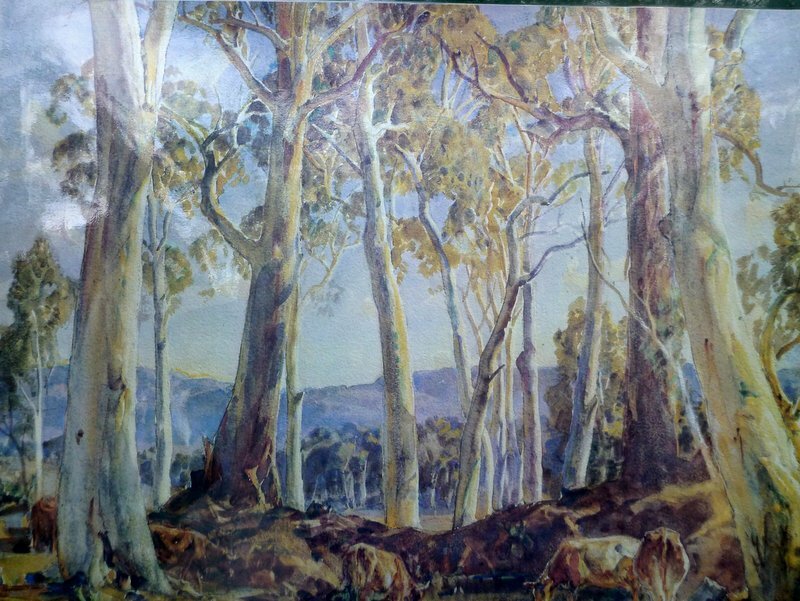 He was the first of the Australian painters to “paint the light”, so a tour of the house and grounds where many of his works were from, was most interesting. We were more impressed by his daughter Nora, largely dismissed and ignored by her father, but she also had a display in the house of probably better paintings, mostly portraits. With her Archibald in 1938, then serving as a war artist serving in New Guinea, with 150 of her works in the War Museum in Canberra, she also made a real impact with her life. Section 3. Crafer to Tanunda. 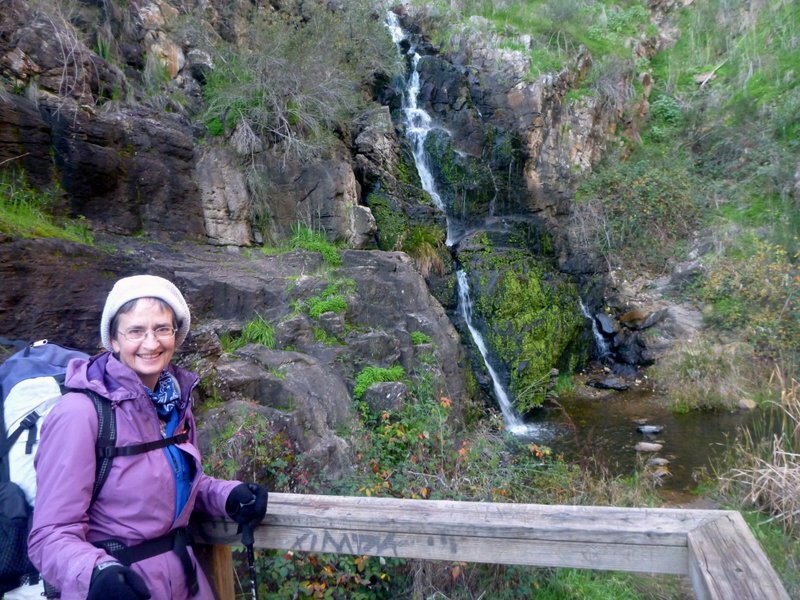 This section has some spectacular walking through Mt Lofty Ranges overlooking Adelaide including the Morialta Cliffs and the Wirra Wirra Peaks. The trail enters the Barossa Valley, famous for its grapes and wines, where we stopped for a few days to catch up on some wines. Mt Lofty Summit except on weekends. Dodging cars on narrow winding roads in some parts of Mt Lofty Ranges. Freemans Hut was a highlight but is now closed after ownership change. Losing trail due to burnt trail markers. 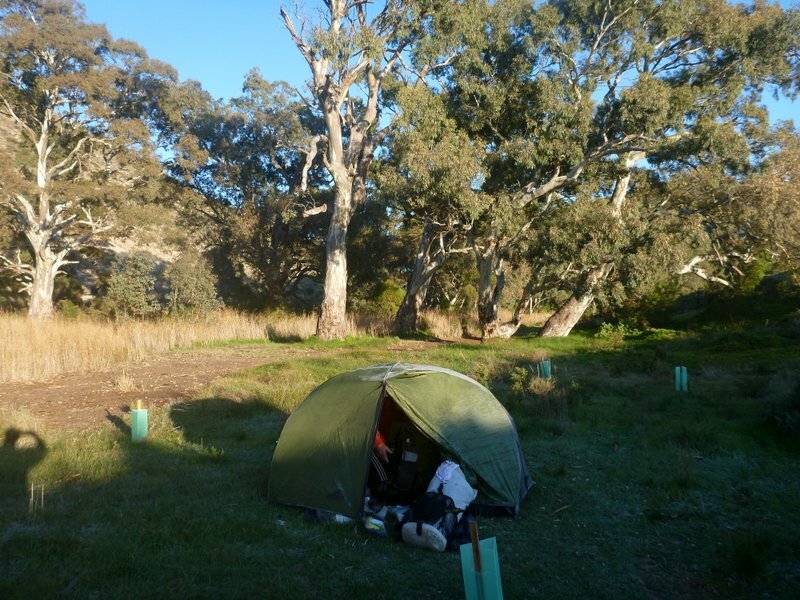 Saturday 20th, Day 12 to 4 mile creek wild camp, 25 km. 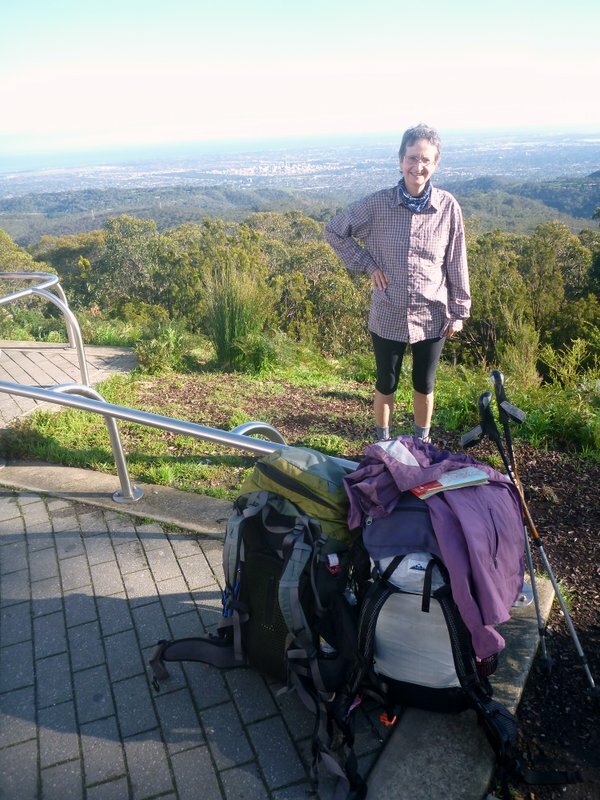 We caught the 8 am bus out of Hahndorf to Crafer at the foot of the Mt Lofty Ranges, so we were back on the trail by 8:50 heading up towards Mt Lofty. Really impressive views out to Adelaide from the top although fighting for space with so many tourists and cyclists on an weekend. Easy walking on a vast network of trails all very well signposted. Many other joggers, day walkers and groups wandering around. We even walked through a colony of koalas, with about 8 very small animals in the trees and one dead on the road. The South Australian species became extinct around 1926, so I think these were introduced from Queensland, a much smaller variety than the Victorian one. We made it into Morialta conservation park by 3:30 pm after several km on sealed and narrow roads with a scary amount of traffic racing past, unable to even walk outside the crash barrier in some places. Finished the day well settled into a warm and cosy nook in the bracken by 5 although we were expecting a cold night after such a clear and sunny day. Sunday 21st , Day 13 to Grandpa’s Hut (Nth Cudlee Ck) 23 km. Today was the best day of walking for the hike so far, mostly on footpaths in the spectacular Morialta cliffs looking out over Adelaide. We met one volunteer out early cutting and poisoning broom that infests the whole area. Later in the morning as we approached the main waterfalls and cliffs, all the Sunday walkers appeared in force, with several groups of up to 20 day walkers, lots of families. No climbers, although the sandstone cliffs looked suitable. 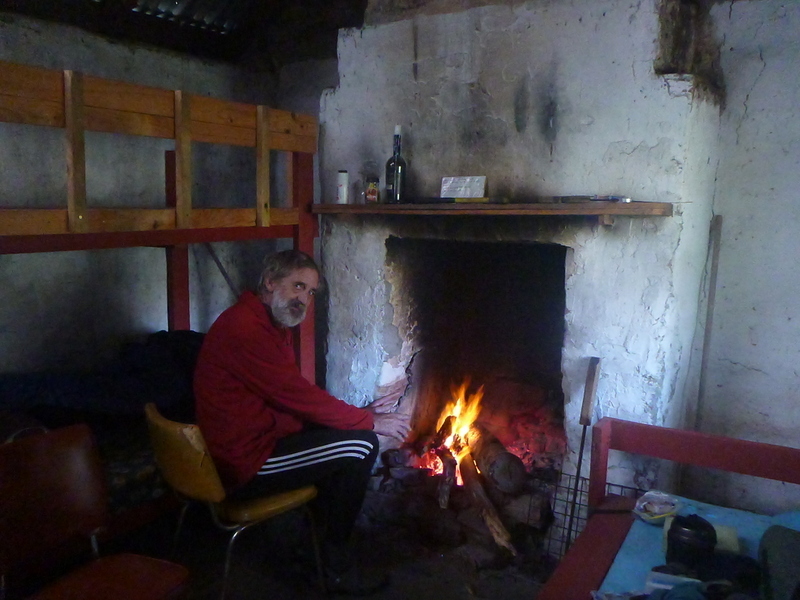 The day was made difficult with several 300+m climbs, but we were able to push on as we knew there was a campsite for walkers with a shelter and fireplace. We arrived by 4:30 to find that the shelter was an open small shed with a loose tarp down one side and the outside fire place was just that. However we found enough wood to have a fire and we were able to sit outside and cook dinner for the first time this trip. Koalas grunting and the tarp flapping were the noise entertainment for the night. 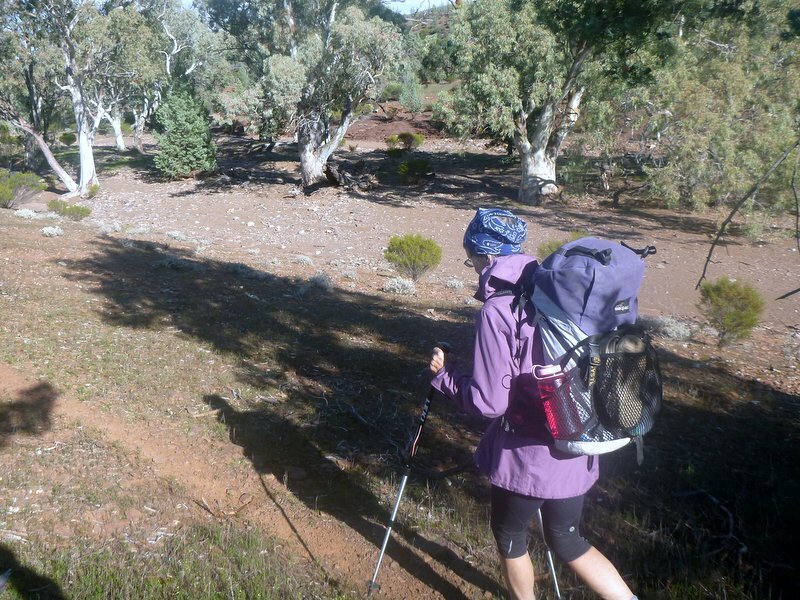 Monday 22nd, Day 14 to Scotts Hut, 23 km. We were looking forward to a mid-morning breakfast at the Cudlee Ck café only to find it not yet open at 8:50. Must have been the day off after a busy weekend. We pushed on into steep hills following the edges of pine plantations, mostly burnt out and with many signs missing and a suspect reroute getting us confused. We dropped off a ridge too early to find ourselves on a main road several km off route, but we were able to follow the road into Kersbrook for lunch. Again the chef’s day off from the pub following the weekend so we had to settle for pie and choc milk at the local servo. Two km later back on trail through farmland and cleared and burnt out forest with confusing trail markers sending us up hills only to come back down. Eventually found Scott’s camp at 4pm and settled into this newish shelter expecting rain. We were very glad of the shelter as it poured and blew all night, such that we had to sling the tent fly across the doorway to stay dry inside. The entertainment for the night were the plastic screens noisily vibrating in their frames. I also discovered that wearing the sleeping bag liner outside my sleeping bag actually keeps the bag much warmer and drier than if it was inside. 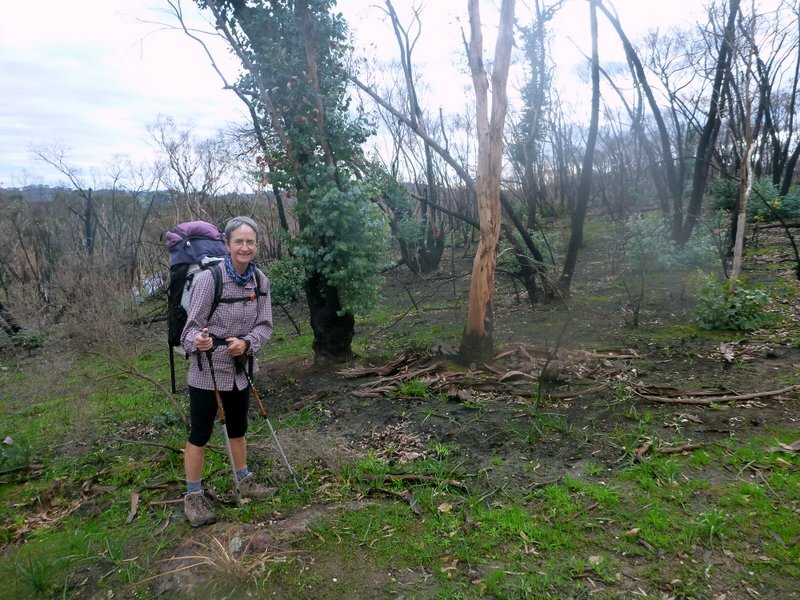 Tuesday 23rd, Day 15 to Freemans Hut, 28 km. We were up and going by 8 am for a solid 4 km road bash before a lovely trail in native bush through Warren Conservation Park. Up to a fire tower then down to the Crawford forestry base for an early lunch on a picnic table! Creative route finding and more roads allowed us to save several km but we still traversed Wirra Wirra Peaks, again through old and undamaged open forest. Many picnic grounds and camps in the area which allow dogs off lead, but no camping over summer. Note Alisons hybrid pack, an ultra light windrider with the macpac top pocket. A clear day but a freezing wind continued throughout the day, made walking the exposed ridges most unpleasant. 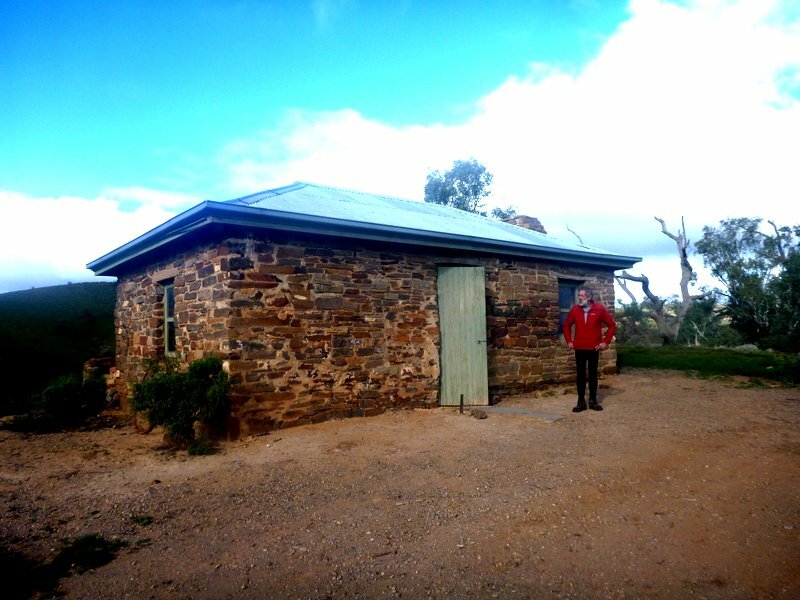 Freeman’s Hut was a highlight, a fully restored stone cottage with open fireplace and bunks for 9. We tensed up when a school group started arriving, about 15 Year 11 Outdoor studies students, but they all established camp around a fire well away from the hut, only visiting us for water. Toasty warm in the hut for the night. 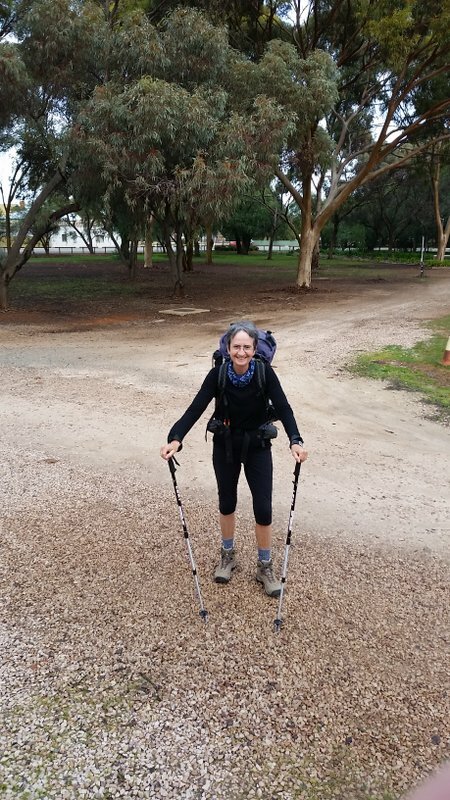 Wednesday 24th, Day 16 to Tanunda Discovery Van park, 28 km. Wandering along farm tracks with sheep and Dexter cattle everywhere, mostly running away from us but the odd cow tagging along behind. 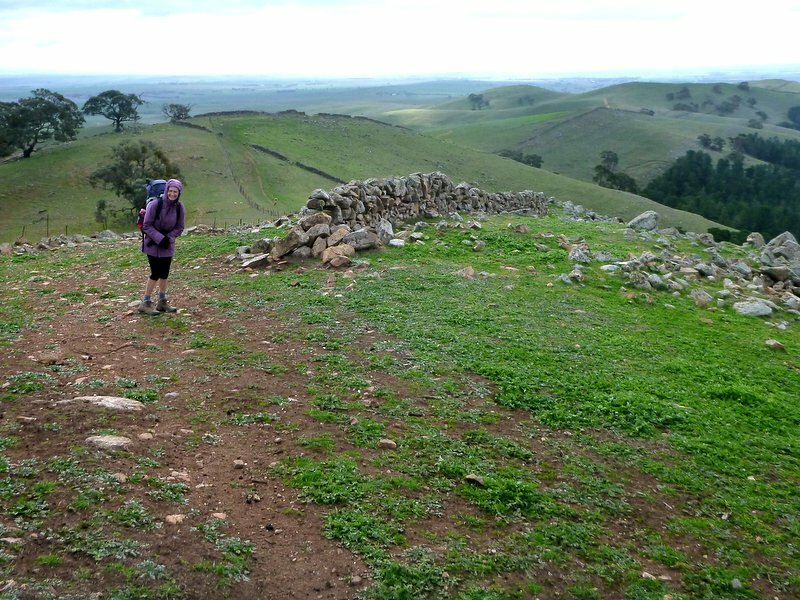 It was a long slow climb up out of Freeman’s Hut to the edge of a plateau, then following roads and fire trails through more farmland. Some native bush along a gravel road with granite outcrops before reaching the northern edge of the plateau and a long gentle descent to Bethany, the oldest Barossa village. Another 4 km down the road to the Van park on the edge of town and they even had a cabin available for us. The next few days is all along flat roads through vine plantations, so we decide to take another zero day and do a wine tour, then a bus to Marrabel to get back on trail on time. Wine and Pizza for dinner after another km walk into town. Just before the descent from the plateau, I found a very wet smart phone on the roadside, so we dried it out overnight and managed to charge it with our charger. We were able to use our sim card in the phone to make a call to the daughter. The owner was a local delighted to get her phone back and gave us a bottle of red for our trouble. Reverse trail magic. Thursday 25th, Day 17 at Tanunda Van Park, 0 km. We were picked up by Timo at 10 for our tasting tour with two other couples, a well off Sydney pair on a weekender and a pair of Grey Nomads on the road with their caravan in a local free park. We visited 5 wineries, Kreissleis, Langmuir, Seppelts, Grant Burge and Jacobs Creek as well as a sausage maker for our salami. Found no reds that I enjoyed but a fantastic Live Wire reisling from the 150 year old vines in the region. Grant Burge sparkling also went down well with their lunch provided as part of the tour. Timo dropped us at the supermarket to resupply, saving a km of walking, so another pizza with the gift red for dinner. Section 4. Marrabel to Burra. We were able to take a ride with the school bus which runs once a day from Tanunda to Marrabel. 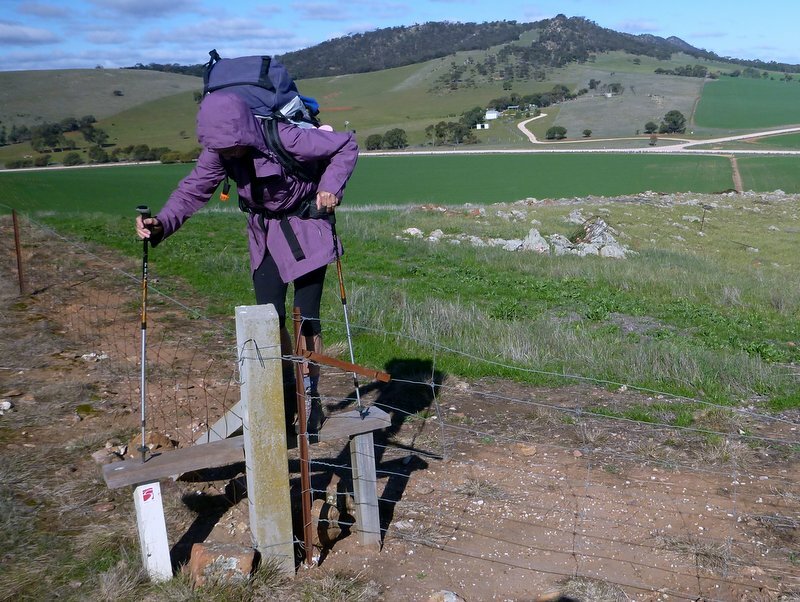 From Marrabel the trail heads into the Tothill Ranges and stays in dry and remote country, so walkers are dependent on farm dams for water. Forested walkways along stock routes. Walking the boundary of Hopkins Creek Conservation Reserve. Stock routes under threat from freehold claims. Little action visible on gully erosion. 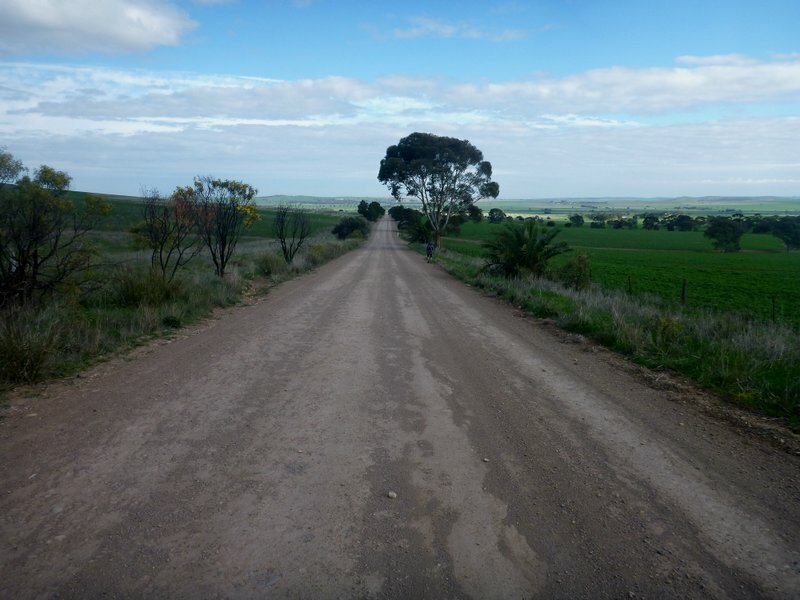 Friday 26th, Day 18 to Marrabel, 3 km. Mooched around Tanunda for the morning with coffee, library, bookshop, gallery, before walking the 3 km out to the Lutheran school to catch the kid’s bus home at 3 pm. No problems, with a wait in the sun, then a 1 hour ride with all the kids being dropped off en-route. Catching the school bus to reconnect with the trail at Marrabel. 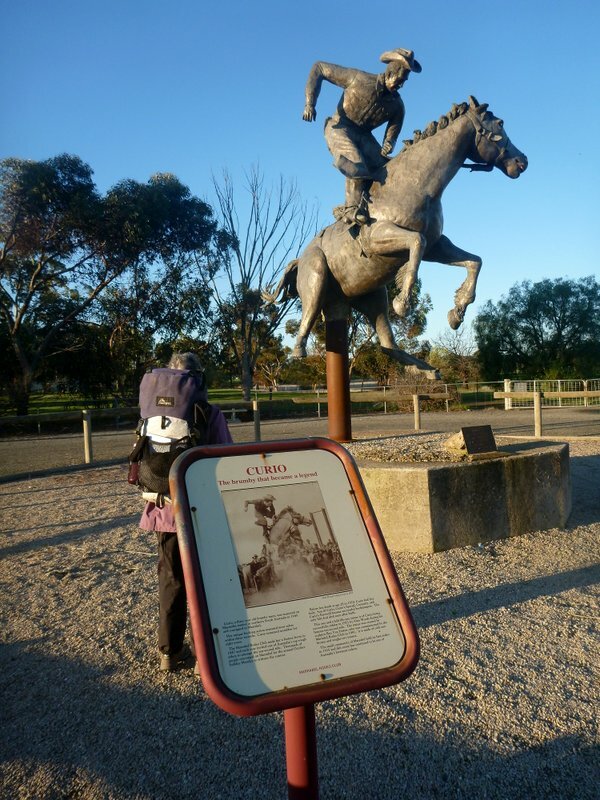 We settled in next to the rodeo ground and a good statue of Curio and his first rider Tom Hall. Cider on tap and dinner at the pub with a roaring fire was most enjoyable until two families with 5 young kids arrived to destroy the ambiance. A very cold and clear night. Saturday 27th Day 19 to Webb Gap wild camp. 28 km. Our tent was so frozen solid in the morning, you could knock on the door. Note to remember to camp under trees to avoid the dew. 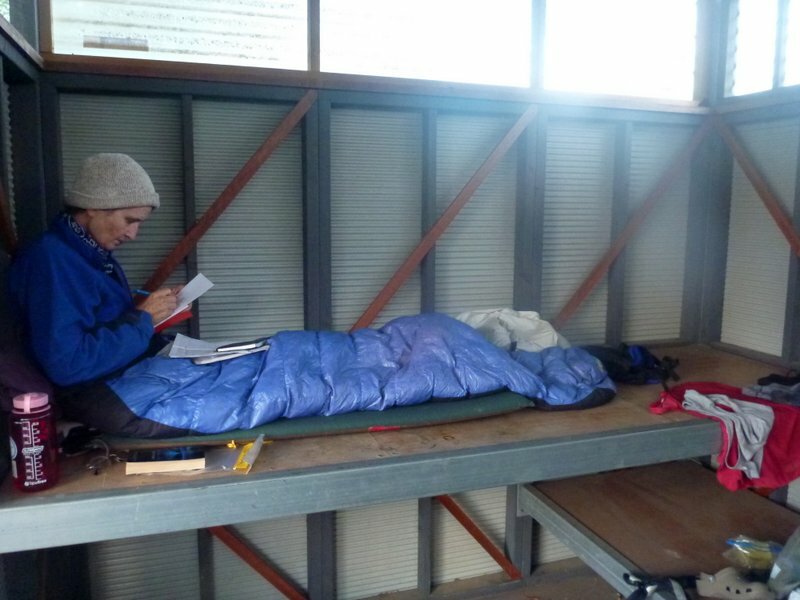 We were still warm inside the tent and sleeping bags. Cold morning but the Mont tent doing well. Breakfasted and away by 8:15 for 10 km to the first of several crossings of the Tothill Range and lunch on a wallaby lawn at the top. All dirt roads through sheep paddocks with a few km of forested stock routes. These walking routes are apparently under threat as adjacent landholders can now claim the freehold which would allow them to clear the lot and ban access. Crossed back over the range at Smith Hill camp which has a sleeping platform and water tank, then a rough descent through open forest on very rocky ground. We had hoped to make the Webb Gap tank, but gave up at 4:30 only 3 km short but at a clear-ish farm dam in regrowth forest with no stock. A clear but windy night so no frost but still a wet tent to carry. Good to meet a landowner, in her range rover, with her husband up on the re vegetated hillside hand spraying for weeds, mostly horehound. Sunday 28th Day 20 to Huppatz Hut, 17 km. Couldn’t find the water tank at Webb Gap, but there was a large dam just at the start of the climb, so I think there is a nomenclature issue, with tank being the local term for large dam. 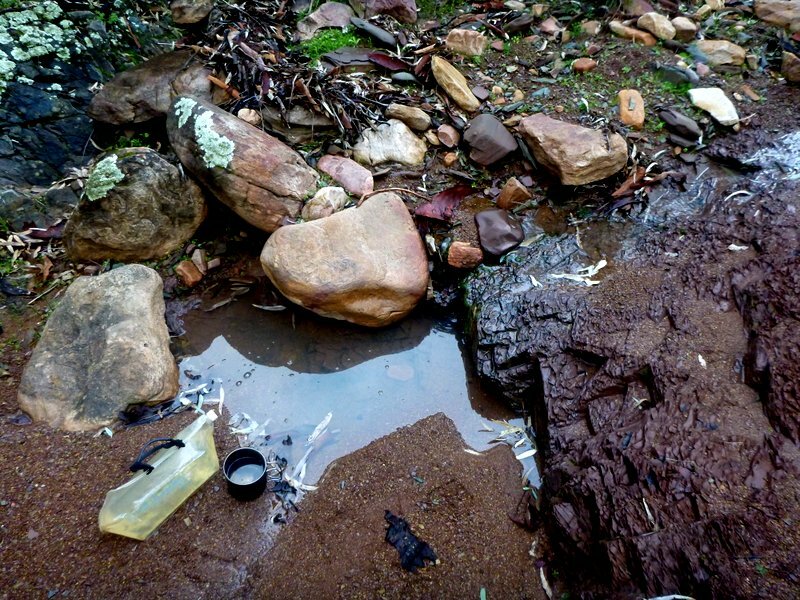 We had much cleaner water at the dam we stayed at, so it was a good decision to stop there. Easy road walking over Webb Gap and along to Niblett Gap with a footpath through regen forest for a while on the western side of the range. Good views of a wind farm, with 37 turbines along the next ridge west, and of Lake Apoinga, a salt lake currently full. 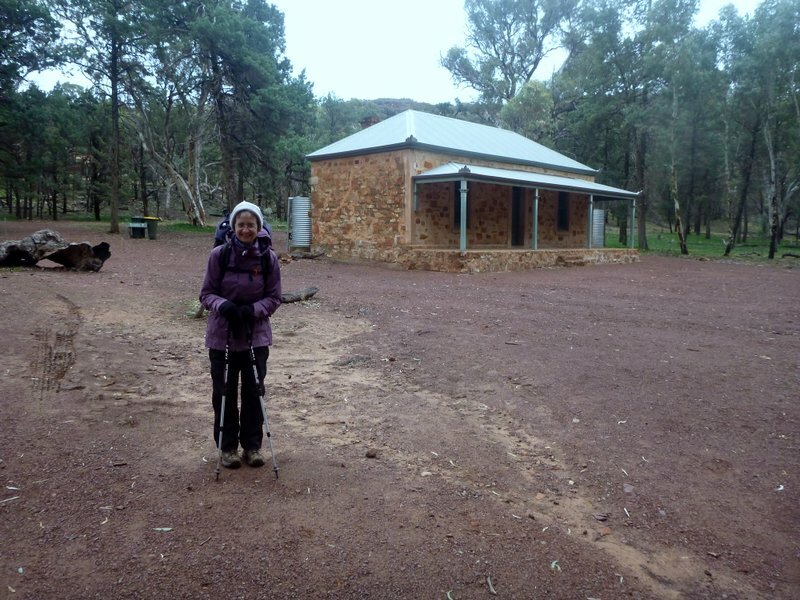 The footpath resumed after Tothill Gap, following fence lines and through sheep fields eventually climbing a wooded valley through an open saddle and gentle descent to Huppatz Hut, a corrugated shed with water and toilet surrounded by sheep, wheat and kangaroos. We heard gunfire on approach to the hut, but no sign of the shooter. Gully erosion is becoming very evident, with little evidence of management to correct the problem apart from some old and poor fencing of the head water. Monday 29th, Day 21 to End of the World, 20 km. Another brilliant days walking, although much of it was along a fence line, crossing 3 ridges in open woodland with many sheep and kangaroo wandering around. Climbing a stile, with the ridges we’d just traversed in the background. The trail bordered a conservation area, again without going into it which we were finding very strange, but we noticed on the map that the creek we were following actually dropped through the conservation area to the Burra Gorge, opening a possibility that we could follow the creek, saving about 7 km of road bash. So we crossed our fingers and headed off down the creek, hoping that the gorge was not too severe. It turned out to be mostly navigable by 4 wd although locked gates prevent such access. We also came across some sheds painted in camo with a flagpole, so we hoped it was a scout group, rather than an adult para military group. Arrived in the campground in time for lunch at a picnic table and a chat with a bus motorhome club on its way to WA with 6 camper buses in convoy. Our best Yogi-ing efforts came to nought without even an offer of a lift into town. 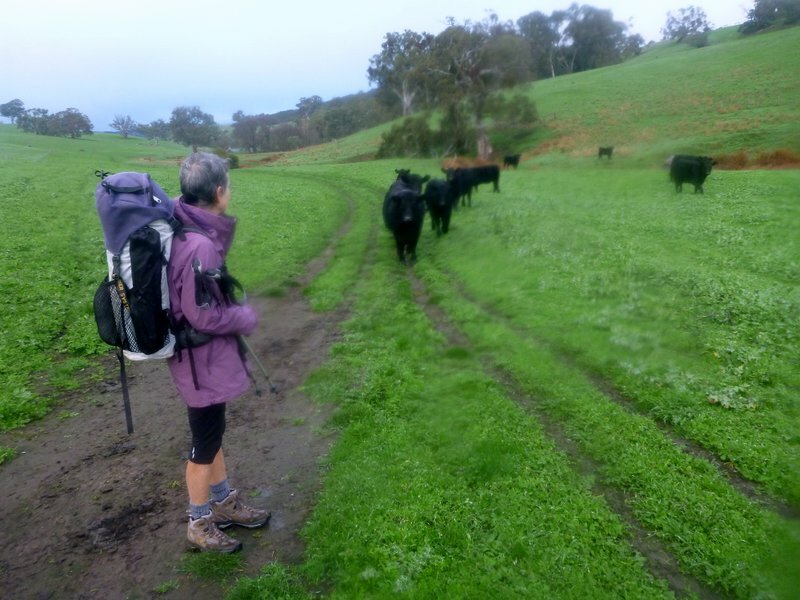 Sunday 30th, Day 22 to Burra, 17 km. This rates as one of the worst days walking, with 12 km of straight and flat roads and fence lines to the Guyder Hwy. Erosion gullies across our route were particularly severe, up to 5m deep, with the trail taking large detours to find ways across. Salination also causing visible damage with several areas unable to hold grass cover, leaving cracking clay on the surface. There were some small plots of planted trees fenced off from the sheep, but the land just keeps looking worse and worse as we go north. We tried hitching on the highway from 10 km out of town but had no offers, however there was a phone signal and Ali was able to ring around to find the local helpful driver Ken who came out and collected us for $10. So we were delivered to the Tivers Row Cottages in time for a late lunch of bacon and eggs filched from tomorrow’s breakfast. Sadly we are at the north end of town with the grocery store 2 km away at the south end, however there is a nearby pub, so fish and chips with cider for dinner. 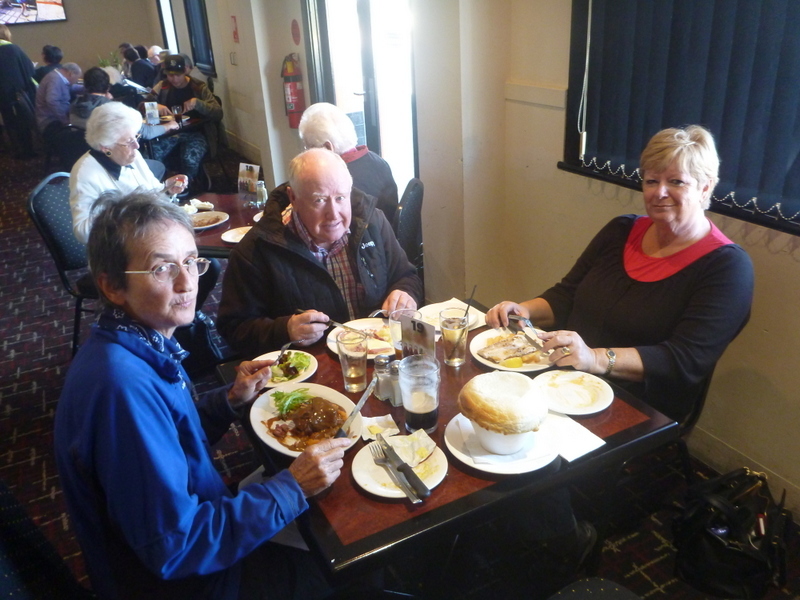 Wednesday 1st July, Day 23 in Burra, 5 km. A day off for shopping and resupply with a 2 km walk down to a beautiful old town with many of the stone buildings intact and cared for. 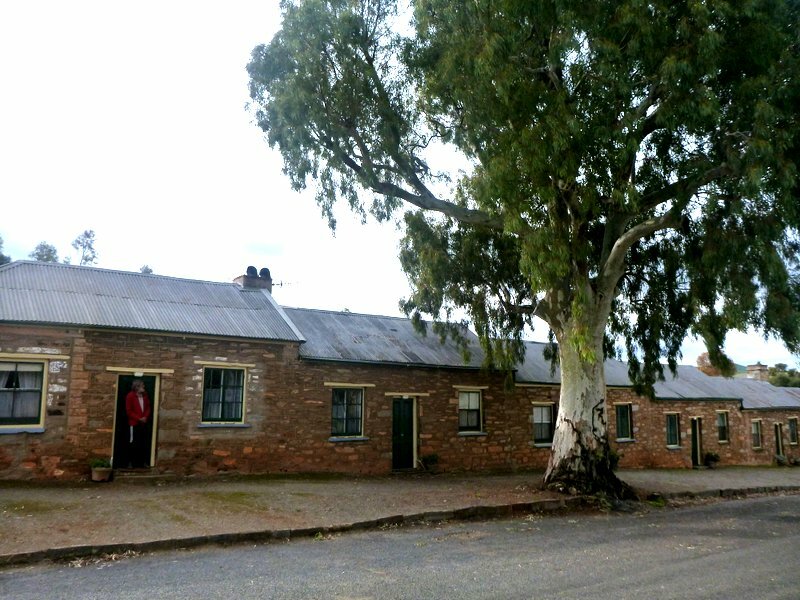 The buildings in need of restoration had our fingers itching, especially with the farm sale money just sitting in our super account making us sorely tempted to invest, as houses in Burra were around $150K with some in the outer suburbs less than $100K. We decided to skip the next couple of days with a lift from Ken to Spalding, then walk from there to Laura where we can catch a bus to the northern terminus of the trail to walk south. We’re over following fence lines and road walking, and much of the trail after Laura has been closed due to fire damage leaving large detours on roads. This plan will allow us to walk the Flinders Ranges, a major highlight, before heading home earlier than planned. Section 5 Spalding to Laura. A pleasant walk along an abandoned aquaduct before heading back into grazing land and burned managed forest. We only make it as far as Georgetown before a better offer comes up. The farmer cutting a ute load of wood, handing some over for us. Seeing Red Deer along the route. Having the chance to take a weekend off on Weeroona Island and be looked after by Bill and Rita. Thursday 2nd July, Day 24 to Bundaleer Tank, 19 km. Ken dropped us in Spalding at 8:30 only for us to discover that we had left Ali’s walking poles in the bedroom in the rush to leave. While we had a phone signal, we were able to contact Snowy’s Outdoors in Adelaide who agreed to send a pair of poles by express post to Laura PO for us to collect Tuesday pm. We hope it works as the Flinders will be too rocky for Ali to cope without them.Today was an easy day of walking following a disused canal finally ending up on a grassy flat just above a silted up reservoir where we can see some of the soil that didn’t make it to Victoria during the overgrazing times. We had rain threatening all day with a cold wind, so we were grateful for the tree planting along the canal providing some shelter from the blast. Arrived in camp around 3 and were seen by a farmer who arrived 30 minutes later with a ute load of wood for us, so we were able to sit around a fire for the evening and let bruised feet recover. Friday 3rd July Day 25 to a Farm Dam wild camp. The trail continued meandering through farmland until the Bundaleer Gardens road bash recommenced with a reroutes around burned plantations. The roadsides of burned eucalypt forest were being logged for firewood with some being left for regrowth from epicormic shoots. We managed to disturb a couple of Red Deer, likely to be escapees from a farm in the area after fire destroyed the fences. The road bash finally finished about 3 km after Curnow’s Hut (closed), for a long and steep climb back to the trail on top of New Campbell Hill. 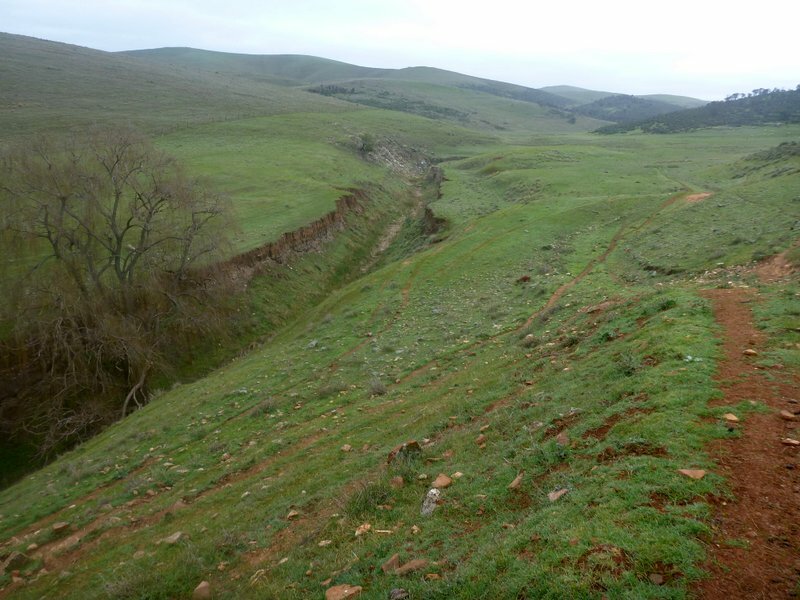 We were impressed by many single layer stacked stone walls about 1.5 m high marking old paddocks throughout this area. Just like back on our farm. Once over the hill, the trail descended gently along farm tracks. The maps show a spring and tank in this area where we hoped to camp, but we couldn’t find anything suitable, so we chose a site under a tree near a small dam with water we were able to filter and treat as there were sheep sharing the dam with us. Saturday 4th July Day 26, 27, 28 at Weeroona Island, 13 km. From our camp near the dam, the track climbed back to the top of another range, undulating along the tops for several km, with good views across the plains to Georgetown. On top of one hill, we came across a 4wd with the driver taking the readings from monitoring equipment assessing the ridge for a wind farm. He said that it looked like the wind along this ridge was too turbulent due to the surrounding hills, and that the turbines needed a more stable flow. After chatting to the researcher, we dropped off the ridge for another 8 km of road to Georgetown, hoping to make the pub in time for lunch. One km down the road and Ali stuck her thumb out at the first car. Local farmers, Rita and Bill stopped, chatted, and made room for us. 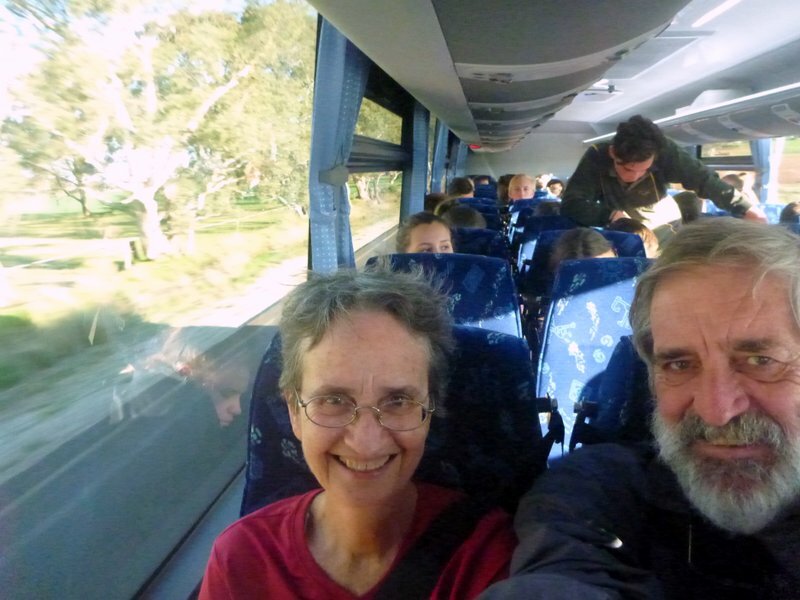 They were a bit shocked that people of our age would be doing such a strenuous hike, and after a bit more chat, offered to take us on a holiday weekend as they happened to be on their way to their shack on Spencer Gulf. Putting us back on the trail at Laura by Tuesday would be no problem, so we “seized the moment” and accepted, if we could feed them and take them out for dinner as well. 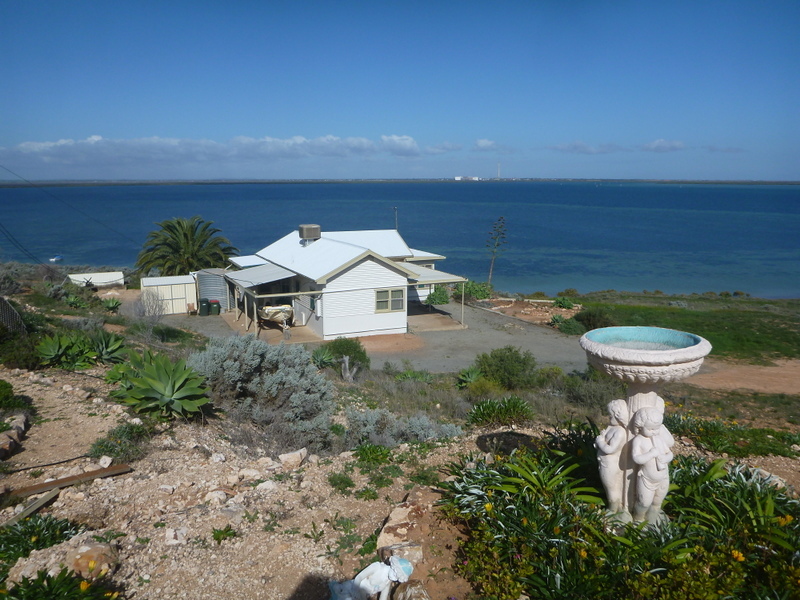 We found ourselves sharing their 2 bedroom cottage on a quartzite hill called Weeroona Island, just across the harbour from Port Pirie with stunning views across the water and of the ships coming and going from the port. Tuesday 7 July, Day 29 to Laura Caravan Park. 0 km. Bill and Rita dropped us off around 2 after a very relaxing weekend off. We found Alison’s new sticks at the Post Office and wandered the town before settling into a large cabin and the pub for dinner. Section 6, Parachilna Gorge to Hawker. This section was by far the best walking for the trip. The wildness and peace at the campsites, the stunning scenery, the wildlife, made it worth every minute. The damage under repair from the pastoralist days is ongoing, but is happening. True wilderness experience for several nights. The infectious joy of a group of section hikers on completion of their through hike. Overnighting in the Wilpena Pound Resort, worth every cent on a hailing day. Final road bash into Hawker. Vehicles in banned access areas. 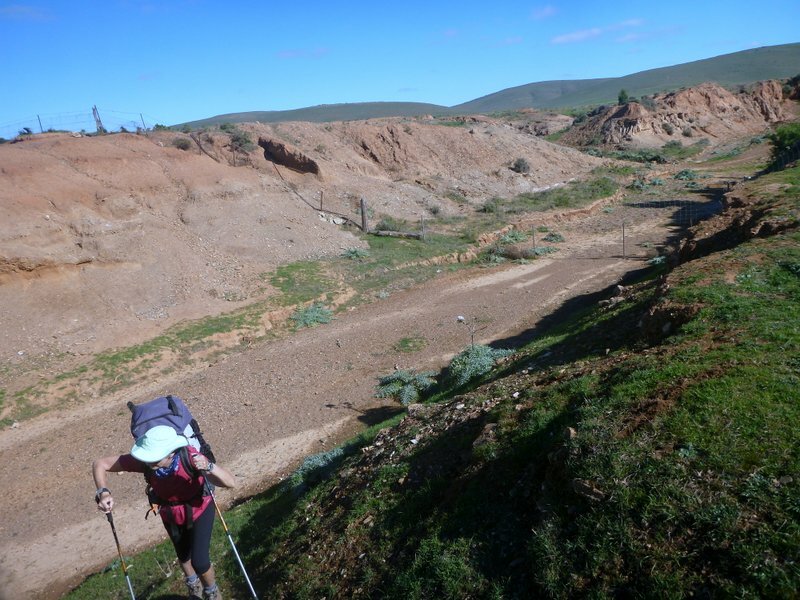 Wednesday 8 July, Day 30 to Parachilna Gorge tank campsite, 2 km. The Genesis bus arrived at 10, but it took 5.5 hours for the drive to Parachilna, with a side trip into Rawnsleigh Park Resort en-route. The resort was busy and active, with the caravan section crowded but not many campers. The hostel bus was waiting for us at Parachilna, and we were able to transfer without fuss for the final half hour into the gorge and the northern trail head. We were surprised by the number of car campers along the gorge road. An easy walk into the campsite, far enough off the road to deter the car people, and plenty of firewood with the tank. An excellent quiet and peaceful night, the warmest we’ve had yet until about 3 am, when the clouds blew away and the temperature nosedived. 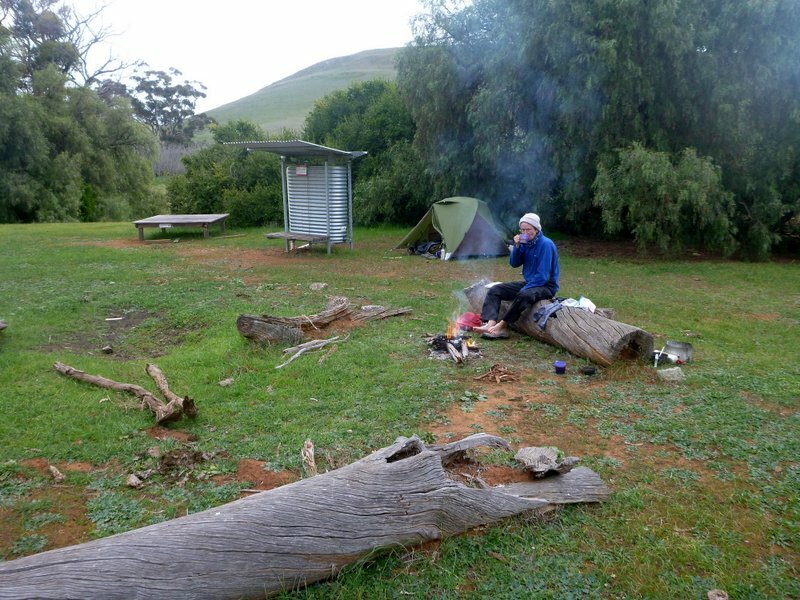 Thursday 9th July, Day 31 to Aroona Homestead wild camp, 16 km. Easy walking along creek beds and 4 wd tracks, meeting a group of section hikers heading north, very excited at completing their last section. We lunched at Aroona Homestead, refilled with water from the tank and kept going carrying 8 l of water for another hour. 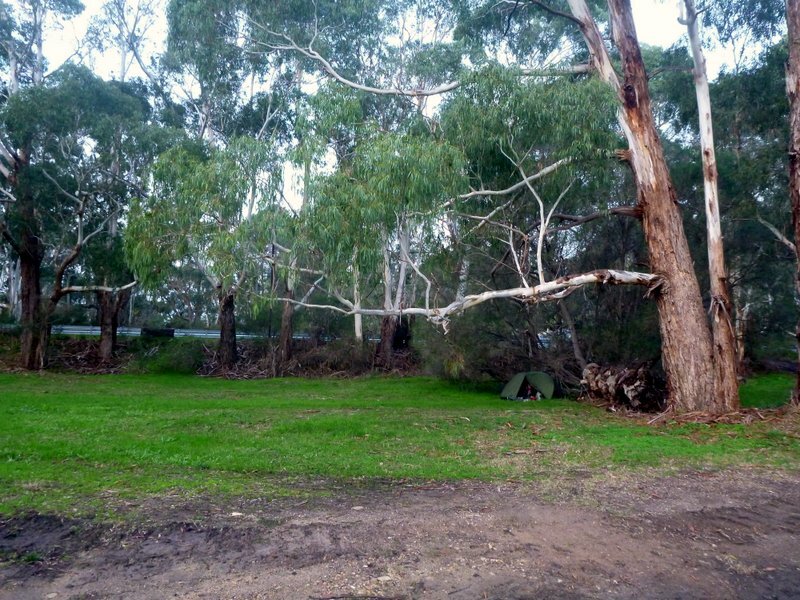 We missed a turnoff, and camped about 0 .5 km off trail near a dry creek bed, a lovely spot on the roadside above the Yuluna Creek in River Red Gum forest. 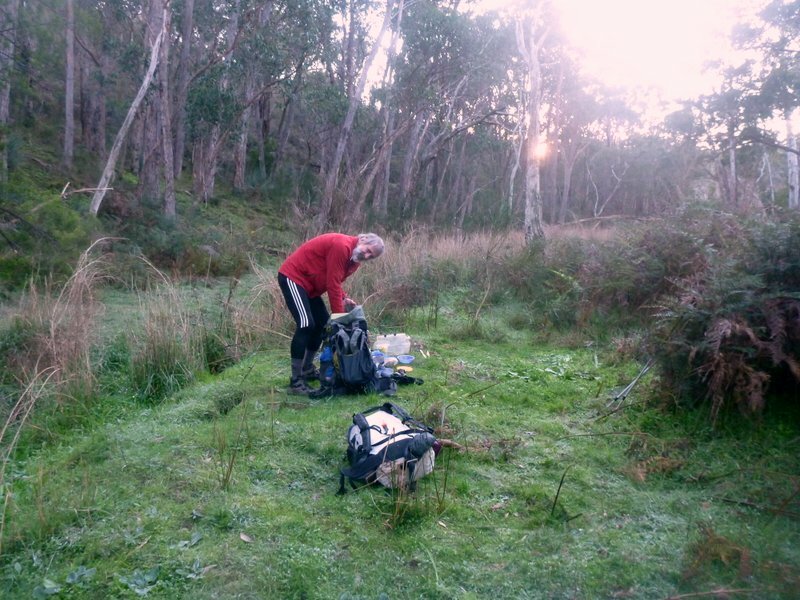 Friday 10th July, Day 32 to Yanyanna Hut, 25 km. Shirtsleeves and shorts for walking today on a really nice track to Trezona campground past the “Golden Spike” (the geological type specimen) for the Ediacaran Period which replaced the PreCambrian Period in 2004. A reroute signpost took us off the marked track and the map, which was really concerning as we had seen no notice of a reroute here, but fortunately it turned out to be a minor change, rejoining the original trail at Middlesight Hut. The rest of the afternoon was a bit of a road bash through over grazed and badly damaged country, with vehicles even using the trail illegally, going around the gates. Yanyanna hut is set back from the road, so few people go in there, but we were a bit worried by two sleeping bags and mats set out on the floor with no other sign of occupation. However the log book records them as being abandoned there about a year ago, so now we are just curious about their story. The hut was well sealed against the wind, but the firebox had a sign from National Parks banning the lighting of fires! Very strange, but we still had a warmer night than we would have had in the tent. As the wind picked up and rain showers came through at around 4 am, the hut proved to be not so well sealed as it looked, with rain spray blowing in through the eaves. We had to turn around so our faces stayed dry. Saturday 11th July, Day 33 to Wilpena Pound Resort, 23 km. 23 km in 6 hours non-stop with cold showery rain all day so we managed to arrive at the resort by 2 to catch the last available room. The campground was by then very muddy and unappealing. We were on footpaths all morning through open forest but then 10 km along a closed road made for a muddy slog, with some sections badly chewed out by bike traffic. The closer we got to the resort, the colder it got, so by the time we arrived the rain had frozen and was coming in on our backs as sand hail. We actually had to stamp ice off our boots before entering the resort foyer, not exactly what you expect for the Flinders. We made a full recovery in the Bistro in front of a big open fire and a cider. 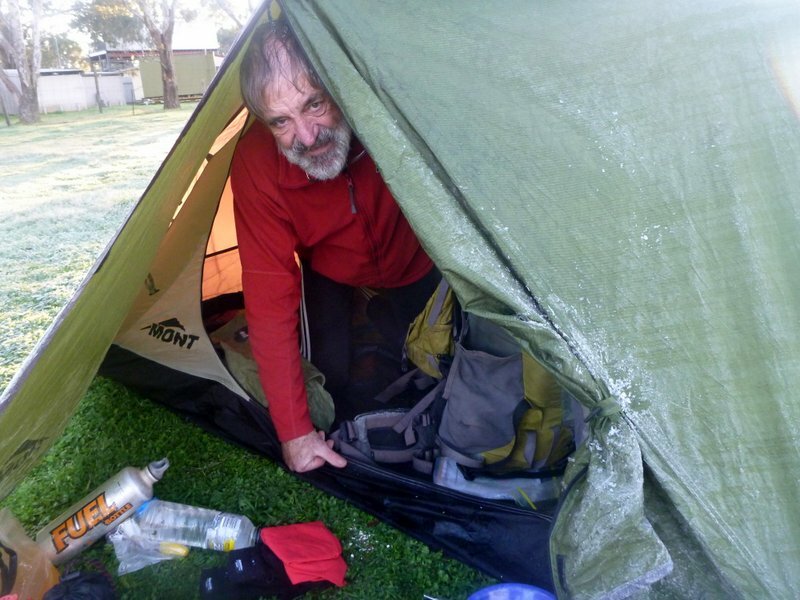 Sunday 12th July, Day 34 to Red Range wild camp, 27 km. The resort buffet breakfast at 7 am was a great way to start the day, but with $220 for the room and $180 for food and booze, we couldn’t do that every night. Easy walking up past Sliding rock to the old homestead, with storyboards scattered around to interpret the scene. The 6 km across Wilpena Pound was tiring as the track was very muddy and kept balling up on the boots until we reached the climb to Bridle Gap, where the mud was replaced by loose rock for a couple of km. 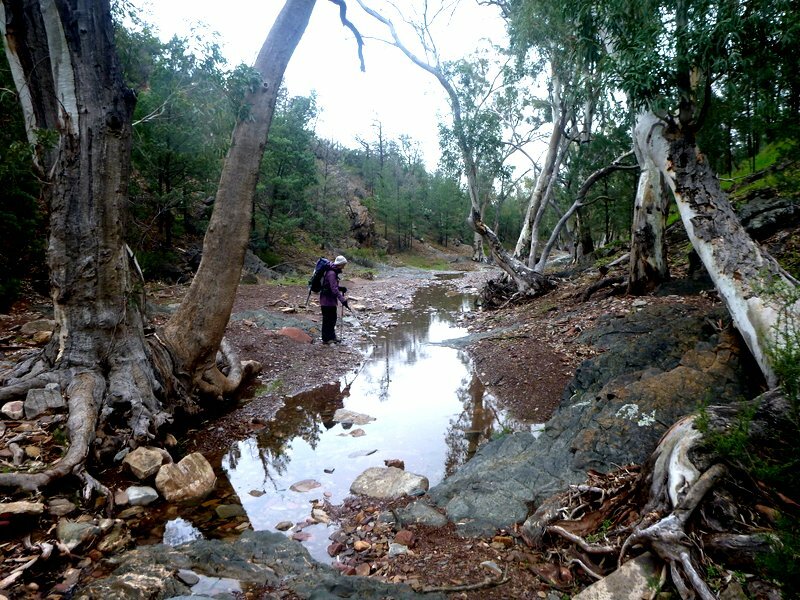 The descent to Black Gap and the creek bed was also very steep and rocky with lots of feral goat sign, but then the walk along the creek bed was quite lovely with water flowing and gums overhanging. 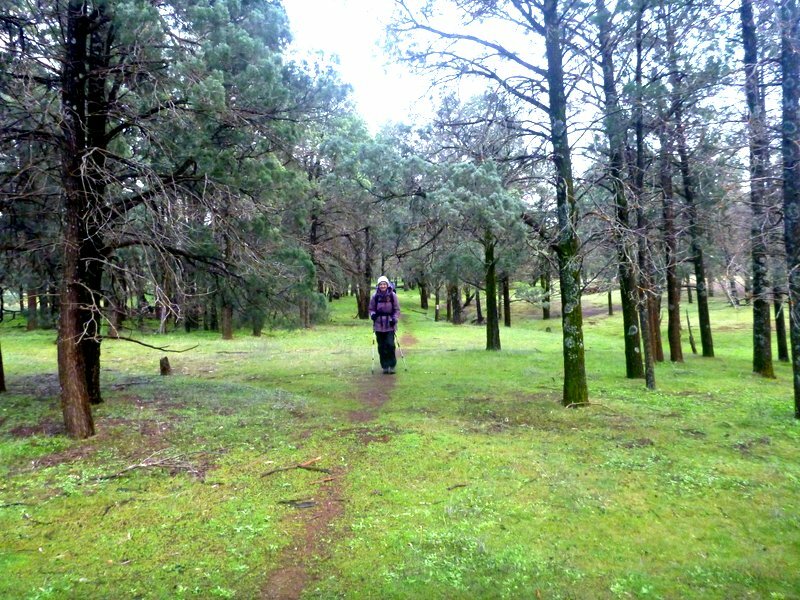 We had our lunch in the shelter of a large old Murray Pine near a bore and yards before reaching the ruins of Umberatna homestead and heading on up all afternoon into the headwaters of the Red and Elder ranges. We found a creek flowing at 3:30 so decided to camp rather than pushing on to the tank and shelter 3 km further on. Monday 13th July, Day 35 to Mayo Hut, 26 km. A brilliant days walking, following Slaty Creek down from its origin through open native forest looking like managed parkland. There was water in most creeks all day, with tracks of dingo, camel and kangaroos all through. 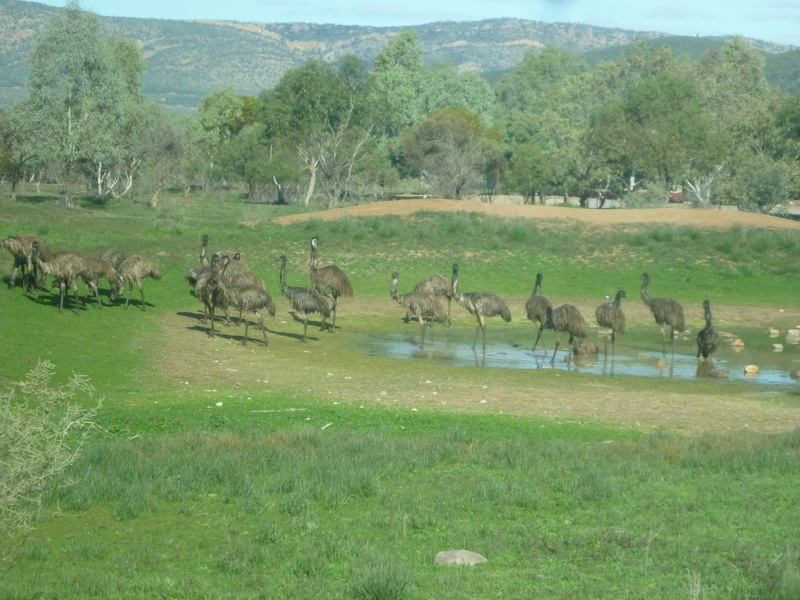 A mob of emus wandered past us completely unfussed by our presence, while every other mob we’d seen has taken off very quickly. Mayo Hut is another renovated hut, the first apparently, with information in the hut about its original family and their lives. The saw pit and cellar structures are still in evidence near the hut. 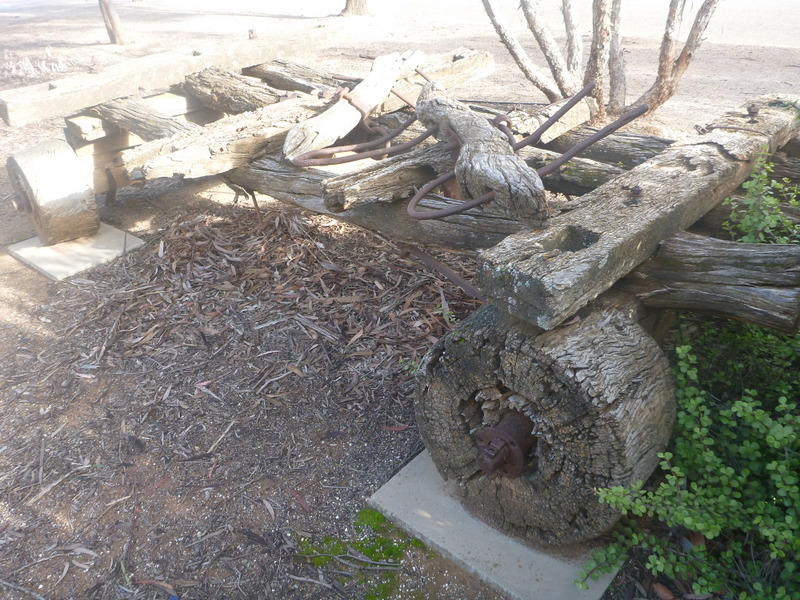 Truck for log carting from Mayo Hut, now on display in Hawker. A couple of other northbound walkers were there when we arrived, but they headed off soon after, somewhat stunned by the small size of our packs. They were both carrying well over 30 kg each. A family staying at the nearby Wonaka station also dropped by for a stickybeak, and left after reading all the signage. 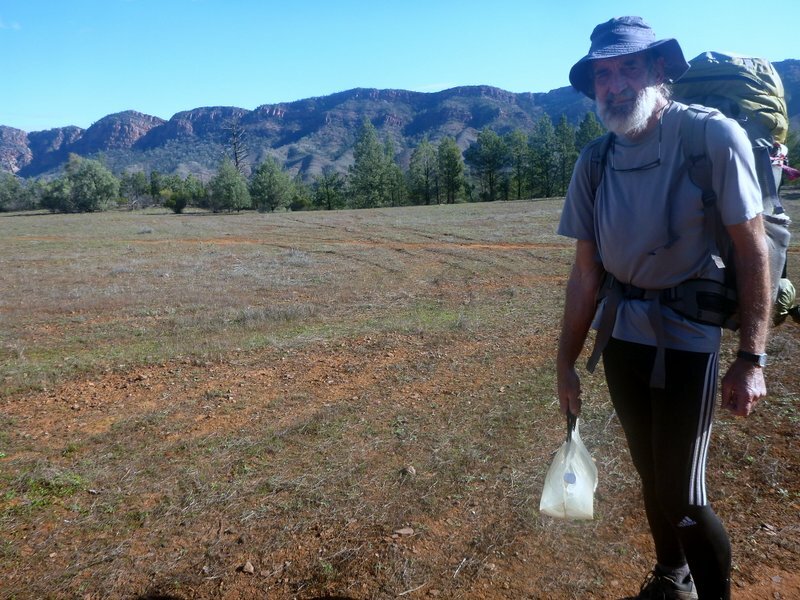 Tuesday 14th July, Day 36 to Hawker, 10 km. Very sad to end this hike on such a low light of a 8 km road bash into Hawker, but there was little other option as traffic was uninterested in picking us up. Managed lunch in the pub and a cabin in the van park with plenty of time to catch the bus to Adelaide tomorrow.